Warning: Because this entry discusses cremation in fairly vivid detail, it may not be for everyone. Varanasi is to Hindus as Mecca is to Muslims or the Vatican is to Catholics: many of the religion’s most devout spend a lifetime planning and saving for the visit they hope to someday pay to the holy city. 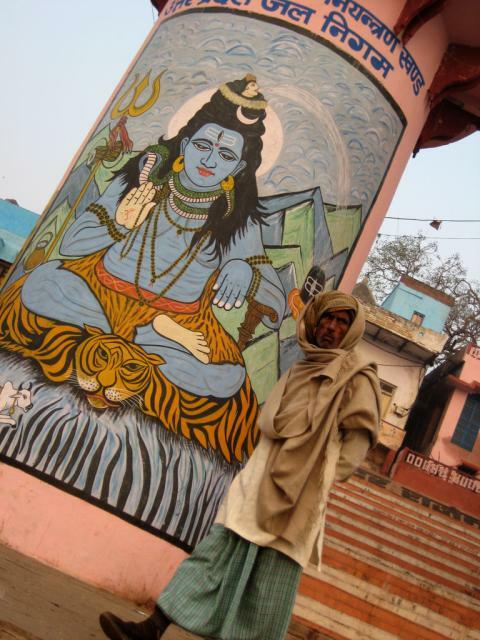 A journey to Varanasi is of specific significance: dying here is said to liberate Hindus from the endless birth-death cycle attendant to the repeated reincarnation in which they believe. Although it was once named Kashi, or “city of life,” Varanasi is a town where many people come to die. The Ganges runs through Varanasi, and many of the dead are cremated on the wide steps (or “ghats”) that lead to the water. Some ghats, known as “burning ghats,” are used specifically for this purpose, and it was at one of these that Derek and I witnessed the many stages of a Hindu cremation. 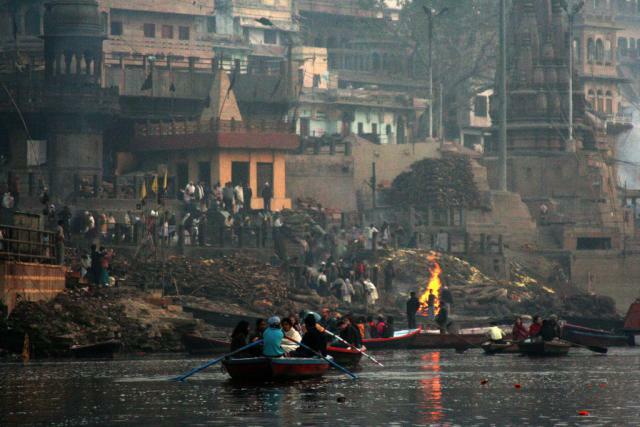 We watched dead bodies swathed in brightly colored cloth being carried through Varanasi’s narrow alleyways and down to the river, where they were doused in the holy waters and then placed upon a pyre fed with wood and fuel. Upon incineration, societal outcasts employed specifically for funereal purposes threw the ashes into the Ganges’s slow-moving current. In the case of holy men and children, we learned, the cremation process is bypassed entirely in favor of throwing the bodies directly into the river. I guess it goes without saying that we found the whole process fairly overwhelming. Still, we were glad to play witness to this most holy of practices. Varanasi seems to be a place better observed than toured. Rather that visiting every site that our guidebook recommended, we spent our time wandering the city’s ghats, exploring its streets and taking in the life along its riverbanks during an early-morning boat ride. Like so much of India, Varanasi is equal parts chaos and vibrancy–a photographer’s dream and a place where we felt very lucky to spend a few days. Two years ago, the Nobel Peace Prize was awarded to Muhammad Yunus, the founder of Grameen Bank in Bangladesh – one of the poorest countries in the world. As a result of the award, the microfinance activities of Grameen Bank and other similar institutions around the globe were brought to worldwide attention. 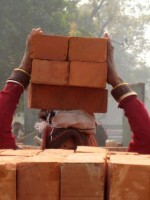 I was particularly intrigued by this new type of assistance to the very poor. With some persistence on our part and a little luck, we were able to contact Grameen Bank and arrange volunteer work with a sister organization, Cashpor Micro Credit, located in Varanasi, India. 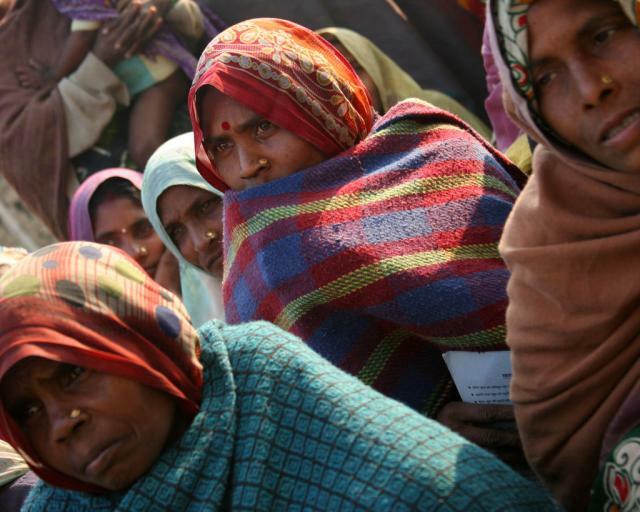 The theory behind microfinance institutions, or “MFIs”, is fairly simple. 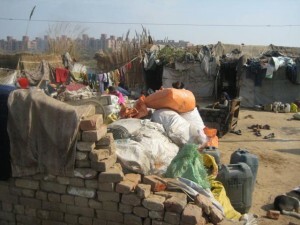 The very poor don’t have access to loans from traditional banks. With no assets and no steady employment, banks simply won’t lend to them. Historically, this forced the impoverished to seek credit elsewhere, mainly from village-based moneylenders. These moneylenders charged exorbitant interest rates (e.g., 100% per year) and had less than gentle collection methods, making Tony Soprano look like Snow White. Second, the amount of the loans are very small. For example, the loans at Cashpor are typically in the $100-$200 range, with the maximum loan topping out at around $350 per year. 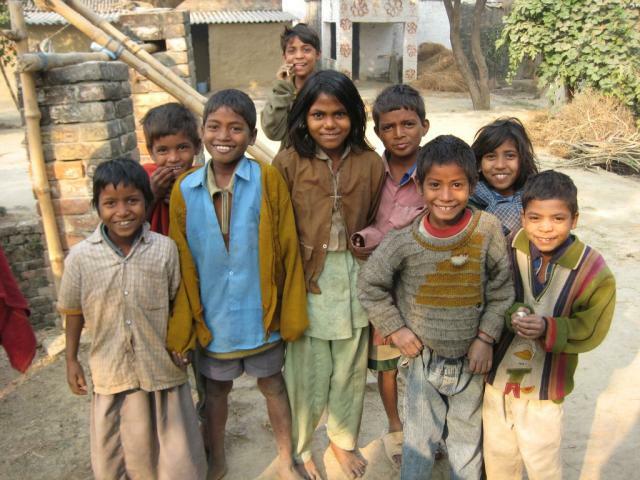 This may sound like a paltry sum, but you have to realize that the average daily wage of the very poor in India is around $1 per day!!! Let me repeat that – $1 per day!!! These funds are used for various purposes, with many of the borrowers using the funds to open up a small shop in the village or, in the villages served by Cashpor, to buy a buffalo (whose milk they sell in order to repay the loan). Third, the loans are only given to individuals who are part of a group, usually consisting of 10-20 members. The group is formed by the women in the village, and new members (i.e., individuals who will receive loans) must be approved by the group in addition to the MFI. 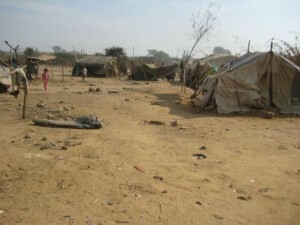 The group members vow to help pay the loan of a member who, for whatever reason (e.g., the buffalo they bought dies), is unable to pay. 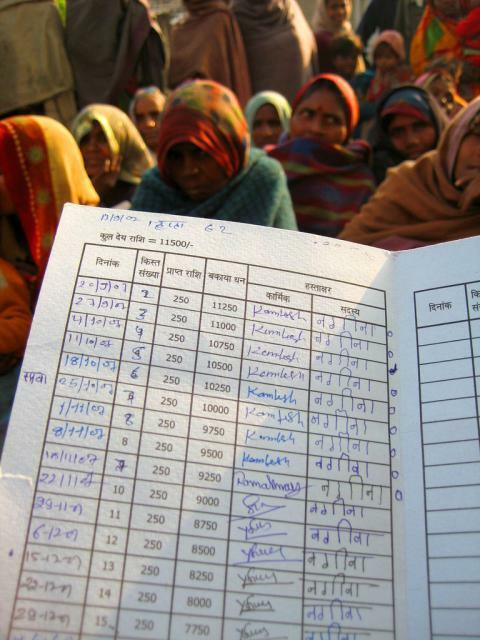 MFIs have been very successful. The collection rate for loans is typically in the high 90% range, a rate that would be the envy of any bank in the world; in fact, many banks are realizing the opportunities that exist in this market (as noted below). 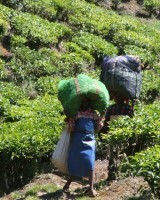 Most importantly, the effects these small loans have on the villages that receive them are dramatic. While the villagers are still poor by our standards, they have used the income they’ve produced from these loans to improve their quality of life, building more protective homes (e.g., graduating from a simple tent to a home with mud walls), improving their nutrition and health and educating their children. During our two days of volunteer work, we feel like we were able to add true value using our respective skill sets. With my background as a corporate and securities lawyer, I was able to help Cashpor review and negotiate the terms of a transaction with the largest bank in India, who wants to enter the profitable microfinance arena but has decided to outsource its activities to Cashpor instead of starting the business internally. In addition, we assisted in structuring a new benefit to the borrowers that forgives loans in the event the borrower or her spouse dies during the repayment period of the loan. As a previous press secretary in the US Senate, Shanna used her media skills to rewrite parts of the annual report that is distributed each year to current and prospective investors of Cashpor. The highlight of our time with the organization was our visit to one of the villages serviced by Cashpor. 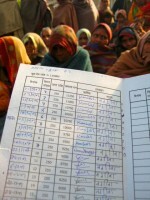 We sat in on two different group meetings, led by staff members of Cashpor on a weekly basis. These meetings allow the villagers to ask questions and voice their concerns, and allows Cashpor to collect the weekly payments (which are recorded in a booklet retained by the borrower). After the meeting, we took a few photos of the women and the children of the village. 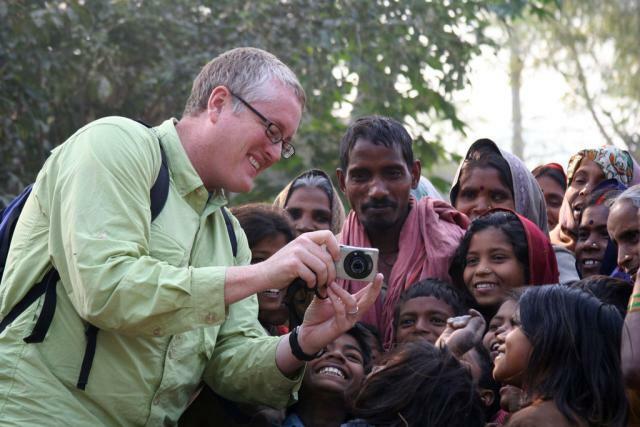 After I showed one kid a picture I took of him on the digital camera, I was swarmed by dozens of other children wanting me to take their photo and show them the result. We’ll never forget the smiles on their faces. 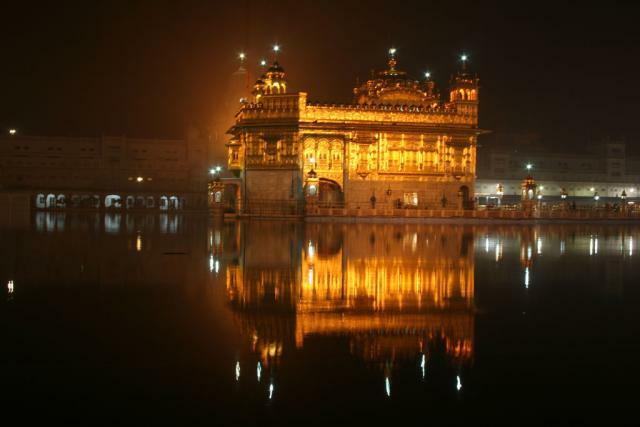 Tourists come to Amritsar primarily for two reasons – to visit the Golden Temple sacred to the Sikh religion and to watch the closing ceremony at the border crossing between India and Pakistan. After a 7-hour train ride from Delhi, we checked into our hotel with the goal of checking these two activities off our list the next day. The Sikh religion is relatively new compared to the other predominant world religions. 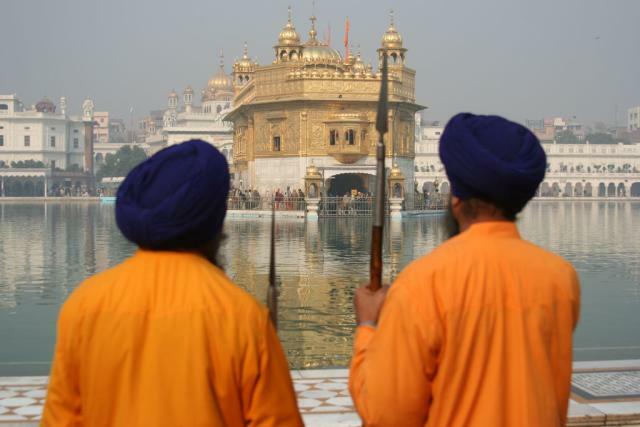 Sikhism began in the 15th century when Guru Nanak became dissatisfied with the Hindu religion, primarily due to its acquiescence to the caste system that pervades Indian society. 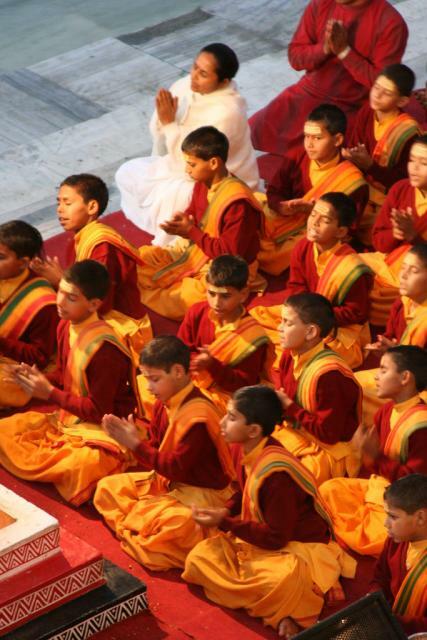 The Guru believed that all should be treated equal, regardless of birth. The Guru’s teachings (and the teachings of the 9 other Gurus that followed him) are written down in the Sikh holy book, the Guru Granth Sahib. 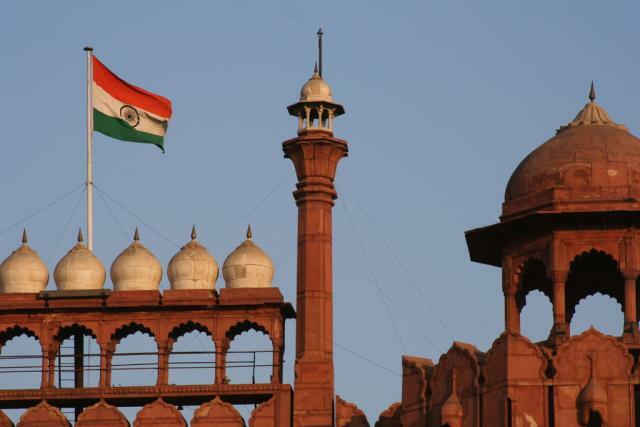 While the religion’s followers are a small minority in India (and virtually unknown to the rest of the world), they have played a large role in recent Indian history. 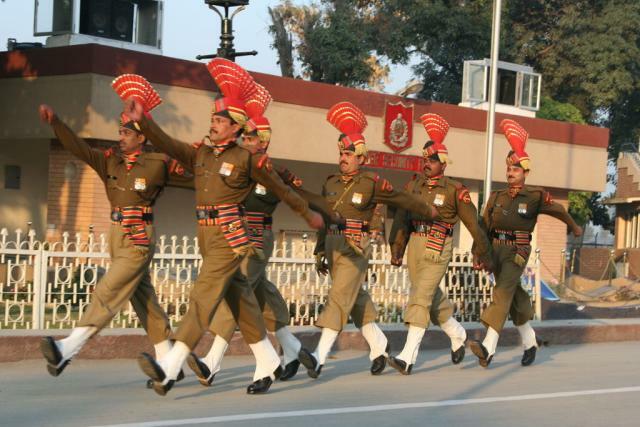 In response to repeated persecution by other religious groups (predominately Muslims in present-day Pakistan and nearby Afghanistan), Sikhs learned the art of warfare and became respected as great warriors throughout India; in fact, many of the leaders of the Indian army are Sikhs. 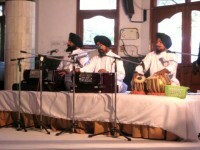 Male Sikhs are easily recognized by the turban worn to cover their head and a typically long beard (one of the customs of Sikhs is to never cut their hair). Shanna’s father’s family is Sikh, so our visit to Amritsar had particular importance. After covering our heads and removing our shoes, we entered the Golden Temple complex. The Temple is a stunning site, covered with over 1,500 pounds of gold that sparkles throughout the day and night (with the help of spotlights). The Temple is surrounded by a pool of water considered holy by Sikhs – it is said to have cured diseases of devout followers. Inside the relatively small temple, priests and musicians take their turns throughout the day chanting scripture from the holy book, which is broadcast on loudspeakers throughout the complex and on cable tv throughout India. One of the most noteworthy practices of Sikh temples (called gurdwaras) is langar – the free meals that are offered at all gurdwaras to anyone regardless of religion, caste or nationality. The langar at the Golden Temple, which is run by volunteers, is massive – approximately 40,000 people dine here for free each day (donations, of course, are accepted, but not at all obligatory). We were able to tour the impressive operation required to feed this mass group, and to eat a simple lunch of chapati, dhal and rice. They even let me attempt to cook some of the chapatis (Indian flat-bread); my service was short-lived considering my skills at flipping the chapatis and transporting them to a basket were woefully inadequate (at least seven of the chapatis ended up on the floor; luckily, it appears that the five-second rule applies at the Temple since they were quickly placed in the basket alongside the non-soiled chapatis). 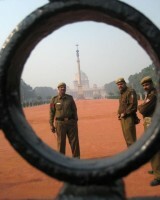 That afternoon, we made our way to the nearby India/Pakistan border. While India shares a huge border with Pakistan, the crossing near Amritsar is the only one currently open. On each side of the border, football-style bleachers have been erected for the thousands of people (mainly Indians; the Pakistan bleachers were nearly emptly, possibly related to the current political turmoil of the country) who come to watch the enigmatic border-closing ceremony each evening. mpting to look as intimidating as possible; however, their flamboyant style and dress looked more like something out of a Monty Python movie. Particularly amusing was the Rockette-style kicks they executed with regular precision. Eventually, the gate was open and the opposing guards stood chin to chin in a staring contest. After a couple of minutes, the stares were broken, the flags of each country were lowered in unison and the border was closed for the evening. Throughout the event, the crowds on each side of the border chanted nationalistic songs with the fervor of fans at a Duke/Carolina basketball game. 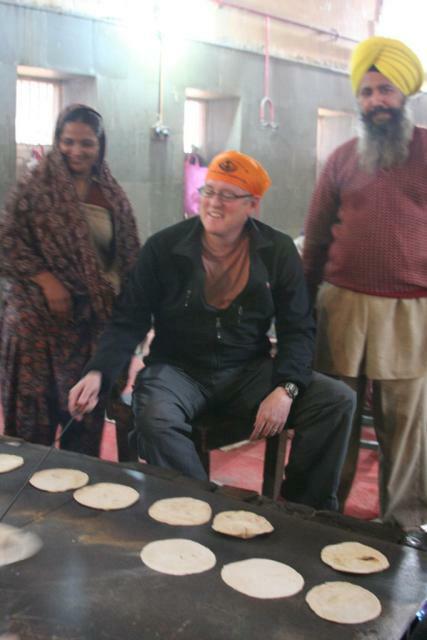 Restrained by Shanna, I was unable to start a “Taste Great – Less Filling” cheer or to introduce the wave to India – the only negative of my visit to Amritsar. In structuring our itinerary for this trip, we have tried to stick to places that are new to both of us. 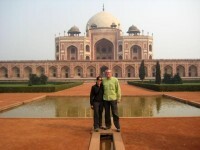 We are making several exceptions for places that one of us has visited before and truly loved. 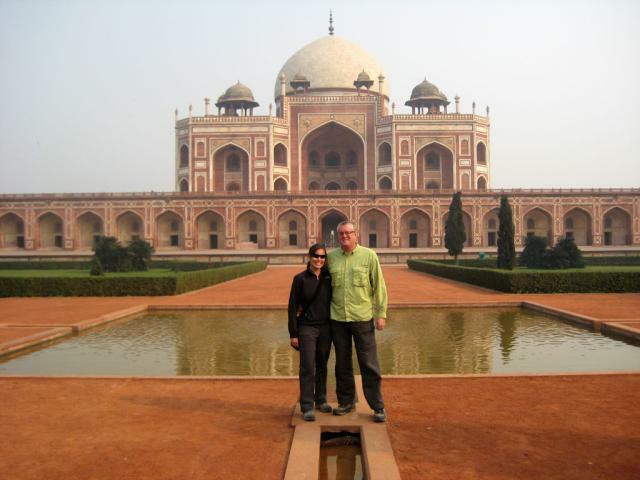 When we knew we were meeting Shanna’s parents in Delhi, India to attend a wedding there, there was no doubt that we would add Agra to our itinerary, regardless of the fact that we’ve both been there before. Agra is famous the world over as the location of the Taj Mahal, which, in both of our opinions, is the most beautiful building in the world. On top of the fact that the architecture and symmetry of the building is beyond belief, the place has an incredibly romantic history. While India is predominately Hindu now, much of the country was once controlled by Muslims (who were called Mughals). Mughal rule in India began in the early 16th century when Babur, a descendant of Genghis Khan, marched into India from his capital in present-day Afghanistan. Babur’s successors ruled much of India for a few hundred years before their power faded and eventually passed to the British in the early 19th century. The Mughals’ many conquests in Asia made them incredibly wealthy. 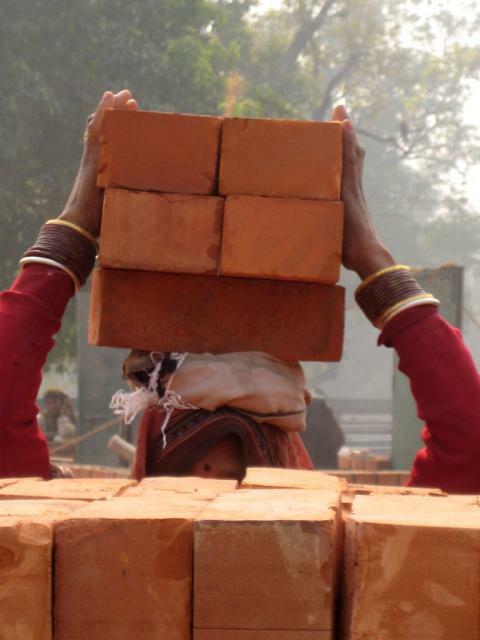 They used these excess funds to build grand mosques, forts and palaces throughout India. One of the greatest Mughal emperors adopted the name Shah Jahan. (This moniker, incidentally, translates to “the king of the world.”) Shah Jahan assumed his duties in 1627 after executing (!) all of his potential rivals to the throne. His majesty demonstrated his penchant for building when he constructed the Red Fort in Delhi and converted the Agra Fort into a beautiful palace that housed himself, his 3 wives and his harem. By all accounts, Shah Jahan’s favorite wife by far was his second one. Far from trying to keep his preferences a secret, he awarded this wife the name “Mumtaz Mahal,” or “chosen one of the palace.” Mumtaz Mahal apparently returned his affection–she gave birth to 14 children in only 19 years of marriage! All of this child-bearing finally caught up with her, and she died during the birth of her 14th child. Shah Jahan was inconsolable; legend has it that his hair turned grey overnight. Soon after her death, he set out to create the greatest monument to love ever conceived. With the help of 20,000 artisans and 1,000 elephants, the Taj Mahal was completed in approximately 1643, and Shah Jahan’s beloved Mumtaz Mahal was finally laid to rest. Sadly for the Shah, he didn’t get to enjoy the Taj for long. He was imprisoned by his own son, Aurangzeb, who took over the throne in 1658. Either as cruel torture or as a gesture of compassion, Aurangzeb locked his father in a room of the Agra Fort that afforded the elder a clear but distant view of the Taj. When Shah Jahan died 8 years later, he was buried alongside his wife in the Taj Mahal, unaware that his final resting place would later become known as the most beautiful building the world has ever seen. I had no idea that those three days would be so enjoyable. The ashram lifestyle proved to be a lot more flexible than I’d imagined, particularly for short-termers like me. I could choose among the center’s offerings at will and spend the rest of my days exploring our nearby surroundings. 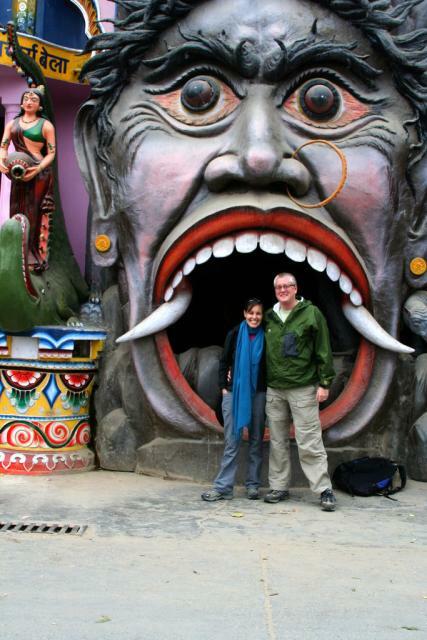 Derek and I had a great time wandering around the town, which sits on the banks of the much-revered Ganges. 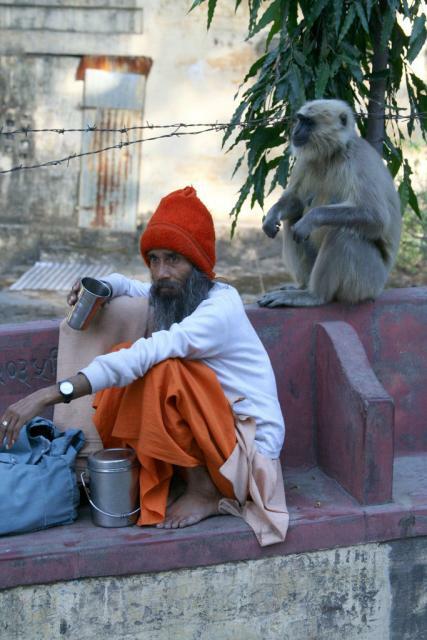 The people-watching alone made the trip worthwhile: mellow, dreadlocked backpackers shared the narrow streets with a collection of even-more-mellow sadhus, a wide variety of souvenir hawkers and a truly overwhelming number of cows, monkeys and dogs. The menagerie ensured that getting from one place to another was always an adventure. From Rishikesh, we made our way downriver to Hardiwar, a city that is sometimes known as the spiritual (if not the actual) source of the Ganges. Every few years, Hardiwar plays home to the Kumbh Mela, a festival that attracts millions of pilgrims and is reported to be the largest religious gathering in the world. The next one won’t take place until 2010 but, even without it, Hardiwar had plenty to offer. We spent the day exploring area temples, each one of which seemed more colorful (and, frankly, more Disney World-like) than the last. Never before have I entered a house of worship by stepping into a gigantic, paper-mache cave. Never have I received holy water by means of a coin-operated religious figure. In the evening, we joined hordes of people on the riverbanks for the nightly aarti, or river worship ceremony. 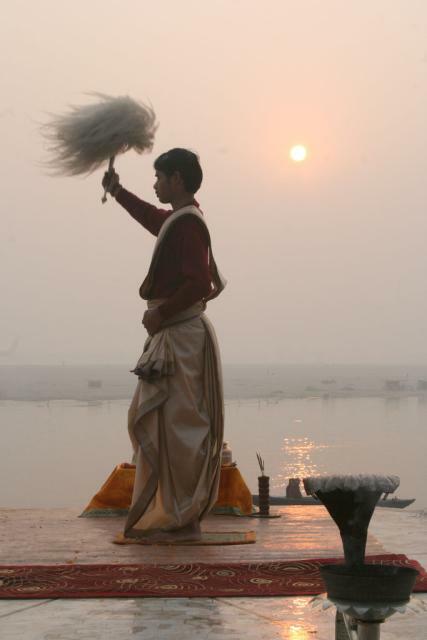 Along with so many others, we placed in the Ganges a leaf basket filled with flower petals and a glowing candle and watched it drift away with the current, past pilgrims washing away their sins in the holy river and off to other cities made holy by the river’s mere presence. 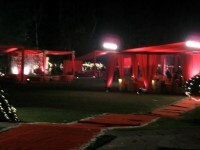 Until last week, all of my impressions of Indian weddings were based on Monsoon Wedding, my favorite movie of all time. 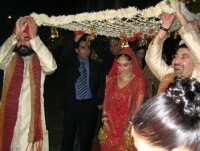 Little did I know that some Indian weddings are of a variety even better than the ones seen on the big screen. The stars of this show were my cousin, Priya, and her now-husband, Druv. Our family poured in from around the U.S. and throughout India to join in the celebrations, which kicked off with a cocktail party that would put Bollywood to shame. There was a rose petal-lined red carpet that led to a huge, red tent, crowds grooving to bhangra tunes and waiters bearing trays of multi-colored kamikaze shots. Enough said. The next day brought the somber ceremony that marks the bride’s transition from her home to the home of the groom. (Priya, like most Indian women, lived with her parents until she got married. Now, she’ll move into the house that Druv shares with his extended family.) As you may have seen in the movies, the groom arrives at this ceremony aboard a white horse, accompanied by a parade of his singing and dancing family members and by a horn band. (Sadly, the horse and the band weren’t allowed inside the military area where the event was taking place, so we didn’t get to see them, although we heard them coming.) The evening was capped off by a traditional Hindu wedding ceremony, which took place at about 2:00 a.m.; what a different world! The following day1 brought festivities put on by the groom’s family to celebrate the addition of its newest member. Out came the red tent, along with hordes of waiters passing every kind of Indian appetizer imaginable, a buffet line that Derek is still dreaming about and the most opulent clothing and jewelry I’ve ever seen. 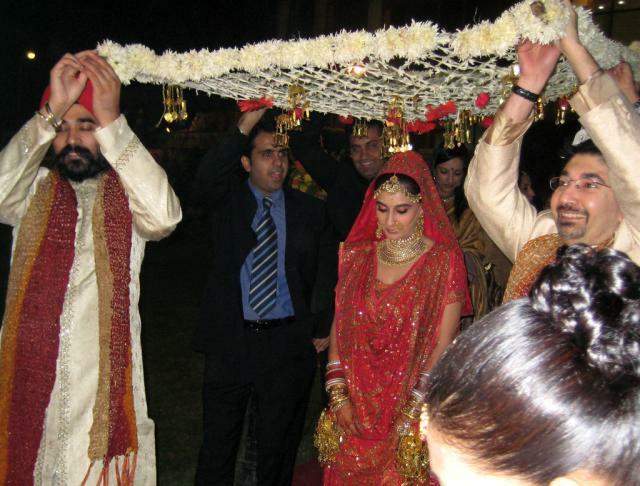 The wedding celebrations came to a close a couple of days later with a Sikh ceremony that honored my family’s traditions. 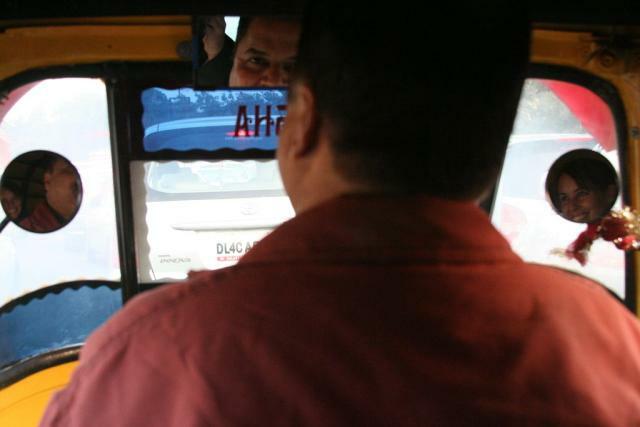 Having grown up on the other side of the world, I haven’t had a chance to spend much quality time with my many family members who live in Delhi. 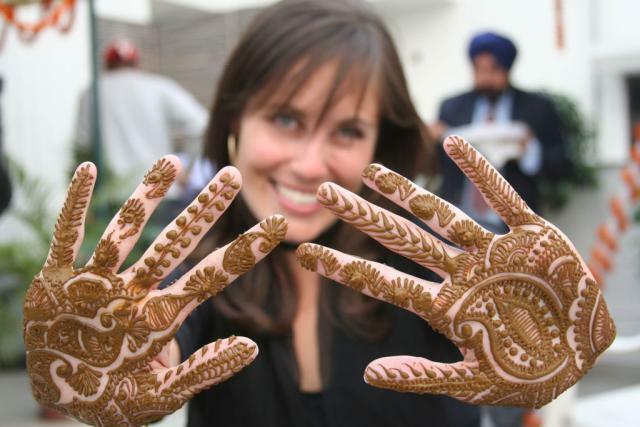 Priya’s wedding gave me not only that chance, but also the opportunity to experience all of the colorful splendor that comes with an Indian wedding. The whole thing felt like a very fancy American wedding that had been dipped in colorful paint and then rolled in glitter. We absolutely loved it. It’s a unique experience when you realize you’ve discovered perfection. Seconds after crossing through the tropical forest abutting the beach and dipping our toes in the poster-board white sand, Shanna and I looked at each other with all-knowing eyes. We instantly knew that we had just stepped onto the most beautiful beach in the world. The Andaman Islands have been on my travel radar-screen for several years; I’ve long heard stories of their remoteness and untouched underwater treasures. Their location in the middle of the Bay of Bengal – east of India, south of Burma and west of Thailand – has kept tourists away thus far. The only real influx of people onto the islands was during the early 20th century, when the British capitalized on the islands’ remoteness by establishing prisons here to house Indian revolutionaries during the British colonial period. Shanna and I had no intention of visiting the islands on this trip. In fact, it wasn’t until I thumbed to the back of my India guidebook that I realized that the islands were a part of India and accessible by airplane from a nearby city. Luckily, tickets were available, and we were on our way. After landing in the capital city of Port Blair, we quickly made our way to the jetty where we caught a 2 1/2 hour ferry to Havelock Island, one of the only islands in the Andaman archipelago with any tourist facilities at all. 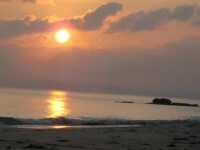 Upon reaching shore, we caught a taxi for a 20 minute ride to our beachside cottage at Beach No. 7. (Unimaginatively named, the beaches share the same number as the nearest village.) Soon thereafter, we made our way to the beach and stumbled upon paradise. What makes the perfect beach? A combination of crystal-clear water with countless tints of turquoise depending on the positioning of the sun in the sky; impossibly white sand free of rocks, flotsam and, of course, litter; waves that rise to a level to produce ample sound as they crash near the beach, but not so violent as to incite occasional fear for one’s safety; a slant to the ground that enables you to walk down a gentle, smooth slope to the ocean and quickly immerse yourself in the ocean waves; a backdrop that includes a towering tropical forest instead of t-shirt shops and high-rise hotels; a complete absence of boats, jet skis or planes dragging signs advertising $5.99 seafood buffets or 2-for-1 drink specials; a water temperature that is refreshingly cool, allowing you to swim comfortably for hours on end without feeling hot or cold; virtually no other beachcombers and zero beach salesmen harassing you with offers of massages, Rolex watches, sarongs, ganja or any other item that they think you’d be interested in; active marine life on the beach, including hermit crabs and seashells with their inhabitants still alive and on the move; and a westward position providing sunsets that quiet all voices. Yes, Beach No. 7 was all of these things and more. After standing in disbelief at the beach on which we were going to spend the next 4 days, we went to dinner at our hotel. 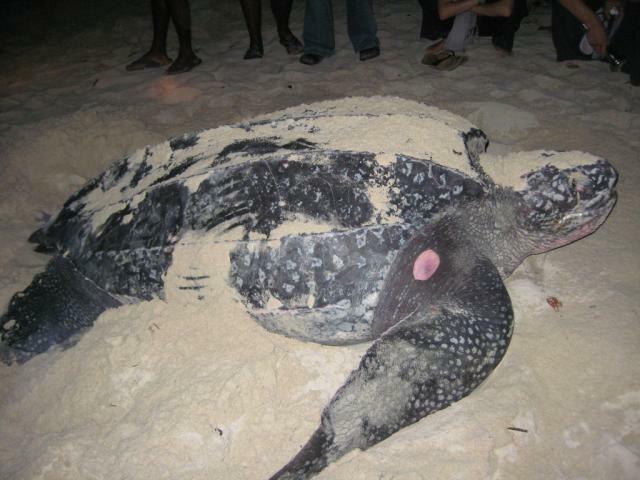 As we placed our order, someone from the hotel notified us that a leatherback turtle was on the beach laying her eggs–an event that biologists wait lifetimes to witness. Without hesitation, we grabbed our flashlight and headed back to the beach. It was completely dark other than the faint light of the millions of stars overhead as we walked down the beach searching for the ancient creature. After a few minutes, we came upon the giant turtle–clearly exhausted after climbing up the beach and digging a hole in the sand in which to lay her eggs, which should hatch into mini-turtles in a month’s time. Slowly, the eggs were laid and the process of burying the eggs began. With alternate strokes of her rear flippers, the sand was professionally shifted to fill the hole. Once complete, she began the seemingly endless process of turning her giant frame back toward the ocean and then crawling the 100 feet back to the cool waters of the Bay of Bengal. On several occasions, I wanted to lend her a hand, but my years of viewing the Discovery Channel and Animal Planet have taught me otherwise. When the turtle finally reached the water and swam out of view, Shanna and I both knew that we’d experienced something that could not be bought. It was hard to imagine any other experience that could make our stay better than it already was, but it came after a long boat ride to an isolated island off the coast of Havelock Island. Shortly after deflating our BCDs (Buoyancy Control Devices) and descending 45 feet under the sea, we were rewarded with coral so colorful it would make a clown blush. Unlike many places where I’ve dived, the coral was full of life – no signs of clumsy divers or uncaring fishermen destroying the reef. The many reefs were supported by a seemingly endless variety and number of fish and other aquatic creatures. After witnessing such a display of life under the sea, I came away from the dive site feeling small and insignificant. When we boarded the ferry to leave the islands, I was struck with great disappointment that our time here was finished, but also a sense of pride as a traveler for finding an unblemished paradise. 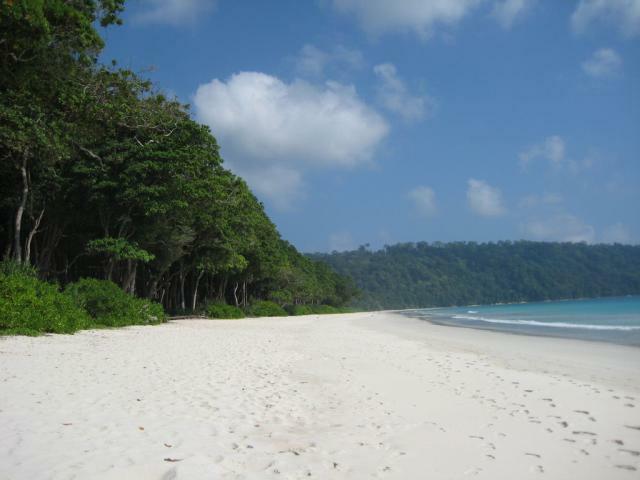 Havelock Island is nature at it finest. After the houseboat docked (sad! We weren’t ready for the trip to end…), we climbed aboard an antique-looking Ambassador (the ubiquitous car of India) and set off on an arduous, 4 1/2-hour drive into the hills of Munnar. 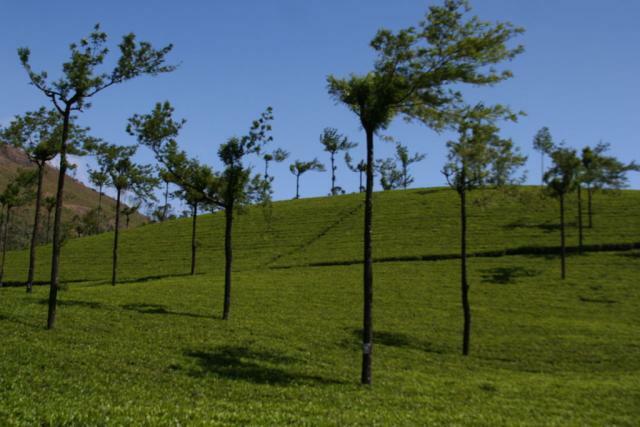 Munnar plays home to a number of tea estates and spice plantations, whose greenery combines to give the whole area a Sound-of-Music-like feel that seems far removed from the general chaos of the rest of India. During their imperial days, the British used to come here to escape the heat, and with good reason: the higher the Ambassador climbed, the more the temperature dropped. Although we didn’t have much time to spend in Munnar (the Andaman Islands were calling our name), we were able to visit a tea museum, where we got a brief lesson on the art of tea production. 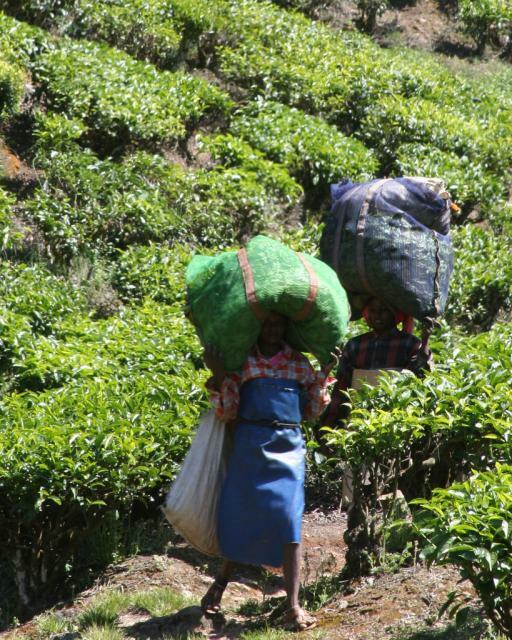 We also stopped to watch a group of women harvesting tea leaves; waist-deep in the impossibly green and manicured tea trees, they gave us a new appreciation for all of the hard work that goes into creating our cups of Lipton.